I made a career decision to pursue what I am most passionate about and where I might have the greatest impact as an educator. Decisions like this rarely come lightly and the first steps are always the most cautious. My inaugural step away from security was made more comfortable by a return to familiar ground. I had a chance to return to the school district where I began my career 29 years ago. 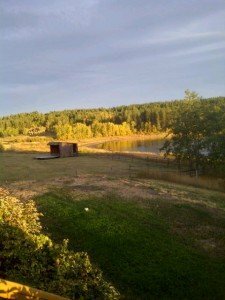 I found myself swamped by memories as the plane touched down at the Williams Lake airport and the drive to town only added further color to my recollections. Dinner with former colleagues and a quick scan of a very old yearbook brought a comfort that clearly escaped Thomas Wolfe when he remarked that one can never go home again. It felt like putting on your favorite old sweater. The one that, despite a few holes, always made you feel warm. The success of the workshop the next day was fueled in equal parts by my desire to ensure the day was memorable for all of the participants and the support of some of my mentors from those early days as a teacher. That some retired colleagues would come out and spend time in a session spoke volumes of their dedication to their craft and of a relationship that started me on the path to where I find myself today. Words cannot adequately express my appreciation for the support I received as a “newbie” and the support I received as this next phase of my career as an educator gets established. What I came to realize at the end of that day is that we all make a different contribution to the success of students and to the success of each other. My circle of influence has shifted considerably in the last five years and I have become a better educator because of the contributions of so many others. There is still so much to learn and my metaphorical classroom (that I sit in as a learner and lead as a teacher) has no permanent home but instead has an ever-changing construct and population. My calendar going forward has trips to Kenya, Nigeria, Nova Scotia, Indianapolis, Niagara Falls, and Nunavut. I know there will be expectations placed on me to provide a spark to further engage the good work of colleagues in all of these locales. I also know they will all provide a spark that will ignite further passions in me to ensure that I can make a difference as an educator.